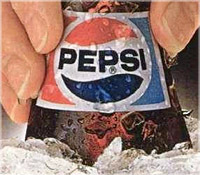 MANHATTAN (CN) – A federal judge refused to dismiss a copyright lawsuit over Pepsi’s time-traveling 2016 Super Bowl ad, allowing an advertising firm’s case to proceed to discovery. U.S. District Judge Kenneth Karas in the Southern District of New York ruled Tuesday that the soda behemoth must face part of a copyright case brought by a Connecticut advertising agency that accused PepsiCo Inc. of stealing its concept for a high-profile Super Bowl halftime commercial. The video begins in the mode of early Motown and R&B set to the Contours’ “Do You Love Me,” then jumps into the high-energy 1980s vibe of Madonna’s “Express Yourself,” ending with a modern pop take on Pepsi’s familiar “Joy of Cola” jingle. The commercial stars soul singer and actress Janelle Monae. Betty claimed Pepsi stiffed it on the agreed-upon $5,000 compensation for the concept. Betty rejected the payment because it did not want to appear as though it agreed to transfer any ownership rights in the human jukebox concept to Pepsi. Pepsi filed a motion to dismiss in November 2016, attacking state-law claims of breach of contract, unjust enrichment, conversio, and unfair competition on the ground that they are preempted by the Copyright Act because the claims relate exclusively to Pepsi’s alleged reproduction and distribution of Betty’s copyrighted material. In a 24-page opinion, Judge Karas dismissed the advertising agency’s claims for unjust enrichment, conversion, and unfair competition, finding that Betty’s “only argument is that its claims are not preempted because it has a property interest in the ideas giving rise to the ‘All Kinds/Living Jukebox’ concept,” which Karas said has been expressly foreclosed by the Second Circuit. Karas also dismissed the breach of contract count, finding Betty had failed to state a claim. “In short, there are sufficient similarities between the works such that resolution of this issue at the motion to dismiss stage is inappropriate,” Karas wrote. The judge gave Betty 30 days to file an amended complaint remedying deficiencies regarding its failure to state a claim for breach of contract. The advertising firm is represented by Mark S. Gregory with Martin LLP. PepsiCo’s attorney, Michael Elkin at Winston & Strawn, declined to comment on Tuesday’s ruling.